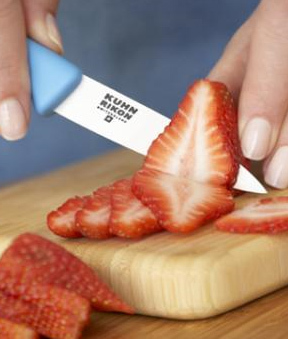 High Quality Cutlery From Kuhn Rikon. A superior quality knife at bargain pricing. This 7.25" swiss paring knife is available in limited supply, for an incredibly low price. It is a model closeout, so once they are gone, we will not be able to get more stock. Order yours today to take advantage of this unbeatable pricing. Each professional quality knife features a Swiss-made, high carbon stainless steel blade and a comfortable, easy to grip handle. This means that it is incredibly sharp, and easy to use. High quality materials ensure that this paring knife will last for years with everyday use. It's the perfect addition to any kitchen because skilled and amateur chefs alike will find it incredibly useful and efficient. It is ideal for everyday tasks, like slicing, dicing, mincing or light chopping so you will find yourself using it frequently for food prep and other cutting tasks. This size knife is one of the most used by any chef or at-home cook, so it only makes sense to get one that is high quality. 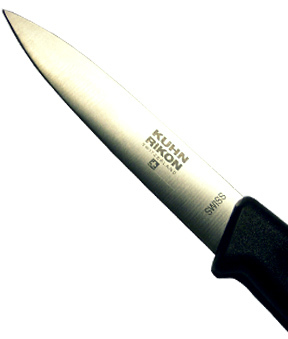 Kuhn Rikon is known for making high quality kitchen gadgets and other tools, and this knife is no different. Thanks to the stainless steel blade and quality plastic handle, this paring knife can be washed by hand or put in the dishwasher. This makes it a convenient tool, and eliminates some of the hassle created by other similar cutlery. The high quality steel that the blade is made from is incredibly strong and can be sharpened over and over if and when it becomes necessary. This means that this knife is able to retain it's original sharpness level for the life of the blade. The handle is ergonomical, so it will be comfortable to hold even for long periods of time. It is designed to reduce wrist tension and provide a natural fit. The integrated finger guard will help to prevent slippage and protect your fingers while slicing. Discover how better quality cutlery can make a difference while cooking. This swiss made paring knife will produce professional quality results while remaining super sharp and easy to use for years. Order Yours Today! Overall Dimensions (l x w) 7.25" x 1"
Blade Dimensions 3" x .75"
Uses slicing, dicing, chopping, mincing and more. 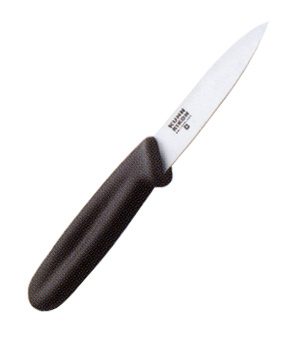 Swiss Paring Knife - High quality steel makes this swiss paring knife super sharp and easy to use. It will work great for any level of user, and last for years. Order Yours Today! The knives are great. I have been using these for several years . They stay pretty sharp for a while after they have been sharpened. One of the ones I just brought, a friend had to have one of them. We love using them. I was very satisfied with the paring knives. I needed new ones. i have used this paring knife for the past few years and found it to be the best that i ever had despite the high prices i payed for others. 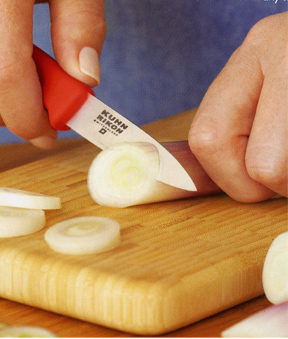 it is great for thingly slicing things like garlic or onion. Is this knife made in Swisserland? No. This one is not.